Graduation requirement effective as of the 2013-2014 school year. “The course shall be established in accordance with the requirements and criteria obtained from the Red Cross and/or the American Heart Association, and the director of the department of health. 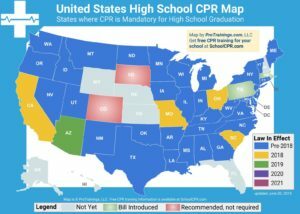 Students do not need to earn a CPR or AED certification. Schools are not required to purchase an AED. The “Minimum Standard” Required by Law: Although practice is ideally performed on purpose built CPR manikins, compressions can be performed on objects such as a soft soccer ball or volleyball to ensure the correct rhythm if manikins are not accessible. Every student should be given an opportunity to practice compressions for several minutes. The overarching goal is to teach students to recognize an emergency, dial 9-1-1, and push hard and fast in the middle of the chest until help arrives. For the AED overview, teachers can simply show a picture of an AED and explain its function and ease of use. If the school has an AED, the teacher should show the actual device and discuss the location of devices on school grounds. The entire hands-only training and AED overview can be accomplished in just one course period over the 4 years of high school. The “Gold Standard” for CPR and AED training remains certification for all students. Certification takes 3-4 hours and there is a cost associated. 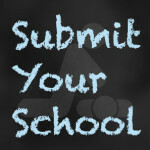 Schools that would like to enhance the learning experience by offering certification are encouraged to do so.